Co-cluster extraction is a basic approach for summarization of cooccurrence information. This paper proposes a visual assessment technique for co-cluster structure analysis through cooccurrence-sensitive ordering, which realizes the hybrid concept of the coVAT algorithm and distance-sensitive ordering in relational data clustering. Object-item cooccurrence information is first enlarged into an (object + item) × (object + item) cooccurrence data matrix, and then, cooccurrence-sensitive ordering is performed through spectral ordering of the enlarged matrix. Additionally, this paper also consider the intuitive validation of co-cluster structures considering cluster crossing curves, which was adopted in cluster validation with distance-sensitive ordering. The characteristic features of the proposed approach are demonstrated through several numerical experiments including application to social analysis of Japanese prefectural statistics. K. Honda, T. Sako, S. Ubukata, and A. Notsu, “Visual Co-Cluster Assessment with Intuitive Cluster Validation Through Cooccurrence-Sensitive Ordering,” J. Adv. Comput. Intell. Intell. Inform., Vol.22, No.5, pp. 585-592, 2018. K. Sjölander, K. Karplus, M. Brown, R. Hughey, A. Krogh, I. Saira Mian, and D. Haussler, “Dirichlet mixtures: a method for improved detection of weak but significant protein sequence homology,” Computer Applications in the Biosciences, Vol.12, No.4, pp. 327-345, 1996. T. Hofmann, “Unsupervised learning by probabilistic latent semantic analysis,” Machine Learning, Vol.42, No.1-2, pp. 177-196, 2001. 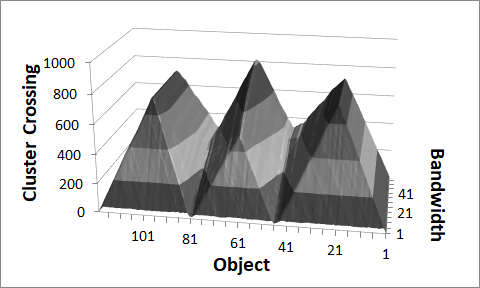 J. C. Bezdek and R. J. Hathaway, “VAT: A tool for visual assessment of (cluster) tendency,” Proc. Int. Joint Conf. Neural Networks, pp. 2225-2230, 2002. J. C. Bezdek, R. J. Hathaway, and J. M. Huband, “Visual assessment of clustering tendency for rectangular dissimilarity matrices,” IEEE Trans. on Fuzzy Systems, Vol.15, No.5, pp. 890-903, 2007. C. Ding and X. He, “Linearized cluster assignment via spectral ordering,” Proc. of Int. Conf. Machine Learning, pp. 233-240, 2004. K. Honda, T. Sako, S. Ubukata, and A. Notsu, “Visual assessment of co-cluster structure through cooccurrence-sensitive ordering,” Proc. of Joint 17th World Congress of Int. Fuzzy Systems Association and 9th Int. Conf. on Soft Computing and Intelligent Systems, paper #50, pp. 1-6, 2017. K. Honda, A. Notsu, and H. Ichihashi, “Collaborative filtering by sequential user-item co-cluster extraction from rectangular relational data,” Int. J. of Knowledge Engineering and Soft Data Paradigms, Vol.2, No.4, pp.312-327, 2010. K. Honda, A. Notsu, and H. Ichihashi, “An efficient algorithm for collaborative filtering based on sequential user-item co-cluster extraction,” Proc. of Joint 5th Int. Conf. on Soft Computing and Intelligent Systems and 11th Int. Symp. on Advanced Intelligent Systems, pp. 4-8, 2010. R. A. Olshen and B. Rajaratnam, “Successive normalization of rectangular arrays,” Annals of Statistics, Vol.38, No.3, pp. 1638-1664, 2010.